We received a sample of a relatively new product called Disruptus , and decided to review it for you teens out there looking for a fun game to entertain yourselves that involves actual face-to-face human interaction, as opposed to staring at a glowing rectangle all day (aka your iPhones). Everything you need to play Disruptus. Oh yeah people, you need people too. So the whole point of this game is to get each player to look at things in a new way, spurring their creative juices while having fun. 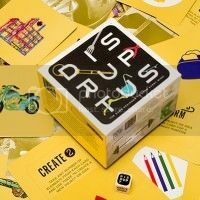 Disruptus has an extremely simple set-up: you get a stack of 100 cards, each of which features a different item, such as a toilet bowl or a bicycle. You roll a die imprinted with six different actions on each face. Whichever action you roll, you must do using one or two cards drawn from the stack. For example, you might roll a “Transform.” You pick a card from the stack, and it is the aforementioned toilet bowl. All players use a sketchpad (included) or scrap paper to describe or draw their best or most outrageous concept of a “Transformed” toilet bowl (a new use for it) before time runs out in the included hourglass. Sky’s the limit here, so you could sketch something like a toilet bowl in a garden with plants growing out of it, or a toilet that has a water fountain spouting from the bowl itself. When time’s up, a judge asks each player to describe their transformation, and picks the best in his or her opinion. Score one for the winner, and the next person rolls the die. Really simple. Perhaps a bit too simple and cerebral for typical teens to get into when gathered around socially with their friends. So rather than recommend this as a great game for teens at home (although it could be that for the right sort of household), we think that this product would shine best in educational settings. Every classroom would benefit from having this and doing a weekly Disruptus session, as it really does force players to exercise their creativity. Another place this game belongs is in companies big and small. Google employees should be playing this. NASA employees as well, as it would probably inspire them to come up with cheaper and safer ways to explore space. And we can also see the value in just rolling the die, picking up a card, and using disruptive thinking when you are by yourself in order to break out of a creative rut or simply provide a boost of inventiveness when needed. For more information please visit http://funnybonetoys.com.